There are many demands on beverages packaging. Apart from protecting the liquid content, these range from responsible sourcing of raw materials, proper product information, the right marketing appeal and eco-friendly disposal. Just how all this can be combined will be showcased at Drinktec 2013: the world's leading trade fair for the beverage and liquid food industry, which takes place at the Messe München exhibition centre from September 16 to 20, 2013. Packaging is about much more than simply the material from which it is made. It also transports emotional messages to the end consumer. An ideal packaging has to be attractive and informative, and it has to be able to carry the desired brand messages. There are many ways of achieving this: through the printing, print-finishing and even choice of unusual shapes – modern technology is making many things possible and giving marketeers a huge range of options for implementing creative ideas. And because the packaging has such a critical role to play in the consumer´s decision to purchase or not, then much depends on the dialog between the technical people and the marketing professionals. The show has set itself the goal of promoting and facilitating that dialog. Rather than leaving that dialog between technicians and marketeers to chance, the organiser is providing a structured forum in which this can happen. Among the many events, for example, are chaired panel discussions. In the future it will be even more important for technology experts and product developers to develop a feeling for the needs of marketing – and vice versa. Focus on Packaging and Marketing is the title of a forum event in the afternoon of September 19 in hall A2. A key trend that is becoming ever more important in this context is the digitalization of marketing communication. QR codes on packaging are spreading rapidly. Drinktec will also be the place to find out about these new techniques and technologies. One of these visitors is Uwe Stoffels, Spokesman for Beverage Can Makers Europe (BCME) Deutschland and manager marketing communications at Ball Packaging Europe. He has high hopes of Drinktec: "Drinktec is a must for us and the ideal platform for talking with experts from the sector. We are looking forward to picking up some new and exciting ideas this year in September." 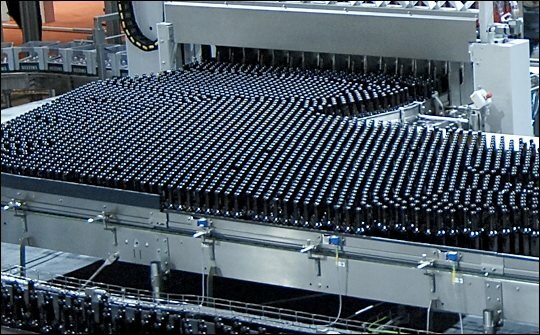 Other dominant trends in packaging to be witnessed at drinktec 2013 are: intelligent product protection, consumer convenience and resource-efficient technology, the latter of course including recycling. In the view of Dr. Johann Overath there are currently two main trends in glass packaging: "On the one hand there is increasing public focus on sustainability. And on the other, in particular as regards mineral water, we are seeing a real renaissance in glass. And in trend beverages, too, we are seeing glass bottles being used for new and innovative drinks." Glass is 100% recyclable, and so, too, are beverage cans. Germany is seeing a return to the use of cans as containers for beverages. Since the introduction of deposits on disposable containers in 2003, beverage-can sales have only now broken back through the billion barrier. In 2011 sales of this type of can were at over 1.1bn, a rise of around 19% or 175m, over the previous year. Even back in 2006 the three biggest beverage can manufacturers – Europe´s Ball Packaging Europe, Rexam Beverage Can Europe & Asia and Crown Bevcan Europe & Middle East – were seeing an upwards trend. These companies are members of BCME, and all of them will be at Drinktec 2013. For Welf Jung, spokesman for BCME Deutschland and sales and marketing director for Germany at Rexam Beverage Can Europe, the advantages for cans lie in their variety of formats and designs, the ideal product protection they offer and in terms of convenience and recycling: "Increasing mobility, the global battle against food wastage and a rising awareness of sustainability are trends in society and good reasons why people are choosing the beverage can. New segments where cans are currently making good ground include health drinks with sensitive ingredients and wines. With the latter in particular the can is the key to reaching a young, mobile target group." Manufacturers are currently working on functional improvements to cans, in terms of better convenience and reduced material consumption. They are also trying out innovative new looks and even a new feel for cans. One example is the development of thermochromic beverages cans, which change colour as they cool down. Another idea is for fluorescent cans that glow in UV light, for use in particular in discotheques and clubs. Tactile cans feel different because of their raised surface designs and they also have visual appeal. All-round modelling, for example, can be used to suggest to the consumer, both visually and through touch, that he is holding an orange, for example. Consumers at the moment particularly like slim cans, and in 2013 a self-cooling can is being launched, on the market in time for Drinktec 2013. Glass and metal are well established, well researched packaging materials. With the tremendous global success of PET bottles, themes like barrier effect have emerged. Much innovative research is being carried out to develop ever more effective barrier layers. This is an important theme, because PET is becoming more and more popular and is increasingly being used in the filling of alcoholic drinks like beer, wine and spirits. Even the beer keg market is now opening up to the use of PET. PET kegs allow drinks companies to deliver drinks anywhere in the world at a fraction of the previous cost, opening up new market opportunities. These lightweight kegs come in 15, 20 and 30 litre capacities for drinks including beer, cider and wine, and are also available in preforms, which can be distributed, blown and filled locally. Petainer, which works with customers including Carlsberg, says its PET kegs cost less than 10% of the price of the alternative steel keg, and offer many other major cost, environmental and quality benefits too. With the general tendency towards smaller and lighter-weight pack sizes and the increasing problem of theft of the traditional stainless-steel kegs (because of its valuable raw material), lightweight disposable beer barrels are now attractive. Recently the first PET bevcan also came out on the market, but at this stage it is only available for aerosols. Perhaps the PET bevcan will already have made its mark on the beverages market in time for Drinktec 2013? Another world first is a cardboard can in which for the first time carbonated beverages can be filled into cardboard material. Cellulose-based packaging for non-carbonated drinks has been on the market for some time, but this is a brand new development for carbonated beverages. Further news on this front may well be available at the show. Packaging is nothing without a label, and of course labels are no good on their own. The art lies in getting the right combination. Drinktec will be presenting the entire spectrum of innovative and sustainable solutions: packaging plus packaging technology, labels and labelling technology. The consumer expects an ever greater diversity of products to choose from. So flexibility is the watchword for manufacturers, both in terms of the liquid content as well as the packaging it is presented in. For marketing experts and designers, too, the challenge is to keep coming up with an ever more distinctive, high-quality visual image for the product. Nowadays, looks count a lot in the purchasing behaviour of end consumers. A tour of drinktec 2013, and a visit to the section called World of Labels (hall A2) will reward creatives from the marketing departments of beverage manufacturers with valuable new ideas and input. According to a market survey by the labeling association Finat, self-adhesive labels are now accounting for a good 55% of all labels used. One reason for this is the wide field of applications for them, and it is this, combined with the diversity of finishes they offer (e.g. embossed, varnished or laminated), that makes them an excellent choice for high-quality labels. High-gloss label paper with a lively, metallic surface effect, for example, is sure to get noticed. Then there is the no-label look, where the content appears to be printed directly onto the pack. Reel products in label supply systems permit continuous automation and, thanks to automated delivery, changeover times on the labelling machines are shorter, because no new handling parts are needed for the different label forms. Furthermore the machines do not get soiled with adhesive residues. In the premium segment of wine, sparkling wine and beer, the no-label look is always an eye-catcher; in product marketing in particular the transparent labels open up new design possibilities, and the users are happy, too, as the labels are resistant to damp and wear. In labeling technology for PET containers, the trend is clearly towards wrap-around plastic foil and sleeve labels. Sleeve labels work on virtually everything. Even container shapes that were previously considered impossible to label are no longer a problem for modern shrink sleeves. Exhibitors at Drinktec 2013 will be presenting the latest finishing techniques and improved foils: shrink sleeves, roll-on, shrink-on and stretch sleeves. The foils are ever stretchier, modern stretch sleeves have twice the stretch capacity as before, and less material is needed to manufacture them. So there´s no longer any need for a shrink tunnel. That saves energy and space. Identification systems should be efficient, low on maintenance, cost-effective and yet of the highest technological level. Often laser and thermo-inkjet-based systems are used, and these are improving all the time, for example with the addition of track&trace features for continuous monitoring and documentation of the products. RFID (radio-frequency identification), despite its still high cost, offers great potential in stocktaking, traceability and brand and product protection. At Drinktec 2013, visitors will be able to see the latest applications, for example, linking to sensors to monitor the cold chain. RFID tags are now suitable for almost all types of surface. In addition, alongside the key players in processing, filling, packaging and labelling equipment, there will be the all-important coding and marking technology suppliers, such as Domino, who will be exhibiting the latest, more efficient and core cost effective solutions for printing on all types of surfaces.